Wrap-Ups are the perfect way to protect canopies and awning materials at your home or vacation retreat when canopies are not in use. It keeps them fresh and clean, so they'll continue to add charm and style (as well as shade) to your deck or patio. 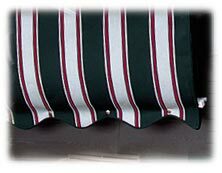 Available in all Sunbrella solid or stripe fabrics . . . to match your canopies. Each Wrap-Up protects one 4- or 5-foot wide section. 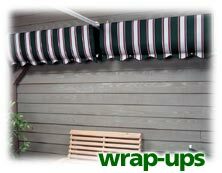 Only $83.95 per section for 60" & 46" Wrap-Ups and $62.59 per section for 30" Wrap-Ups. . It's easy . . . just wrap them around your retracted canopies and you're done! May also be used to protect canopies when they are removed and stored during winter. It's a snap . . . just wrap them around your retracted canopies and you're done!